Welcome to the online home of aana jaana, a project in support of migratory herding communities and textile artisans in Himachal Pradesh, India. We work directly with herders and artisans to bring you high-quality woolens grown and made by hand in Himachal Pradesh, India. Shawls and fabric are entirely handwoven, often of handspun yarn. All cut-and-sewn items are currently made in the US by Jen at her home studio (aka kitchen table). We’re in the process of developing our product lines, so check back frequently for new arrivals. Meet some of the people and organizations that make this work possible. Kandvari, a new endeavor in the village of the same name, is revitalizing the use of soapnuts by processing them into a natural laundry detergent. Read an interview with founder Sumant Bhushan here. Kulvi WHiMS (Women of Himachal Self-Help) is a micro-enterprise group in Kullu valley working with textile crafts to provide income-earning opportunities for rural women. Mera Gaon Mera Gaurav (My Village My Pride) is a registered society working to strengthen the village economy through traditional livelihood skills associated with livestock rearing. Anthropologist Anna Tsing suggests telling “a rush of stories” as a way of understanding the complex and ever-shifting tangles through which life pulses. 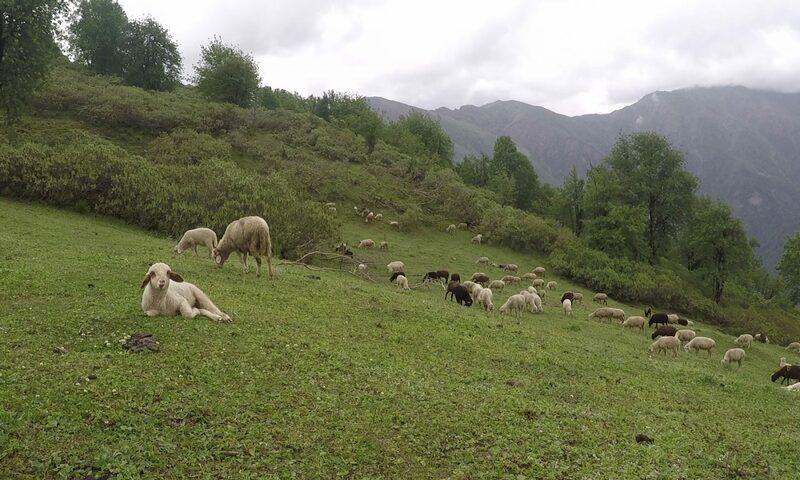 Sheep, forests, herders, rivers–here we’ll trace some of the strands that thread through the Himalayan landscapes that produce our wool. What is Interdisciplinary Textile Research, Anyway? The Hindi verb “aana” means “to come;” “jaana” means “to go.” Together they convey a sense of back-and-forth motion. The name “aana jaana” references many levels of movement: the migratory routes of Himalayan sheep and goat herders, my own travels between the US and India, and finally the circulation of handcrafted products as they are purchased, gifted, and worn. Through aana jaana, I work directly with herders, weavers, and knitters to develop new markets for their wool and woolen products. We’re working things out as we go, so check out the stories page and subscribe to the mailing list for updates on the creative, logistical, and ethical twists and turns of the work as it progresses. I’m a hobby spinner-knitter-weaver turned interdisciplinary researcher with a B.A. in Anthropology and M.S. in Textiles. This project grew out of obligations to the herding and weaving communities of Himachal Pradesh, India, who have welcomed me in over several years of travel and research in the region. In 2015 I studied natural dyes in Kullu valley on a grant from the UC Davis Blum Center, and in 2017-2018 I spent 10 months studying wool production in Kangra and Kullu districts on a Fulbright-Nehru student research grant. You can read about some of those experiences on my personal blog. "How do we create and proliferate a compelling vision of economies and ecologies that center humans and the natural world over the accumulation of material?